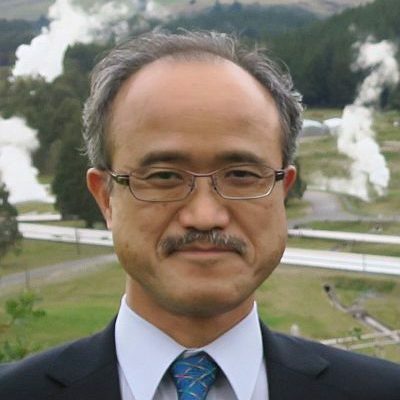 My name is Toshihiro Uchida and I have worked on the research in geophysical methods for geothermal exploration and other geological/geoengineering applications for more than 30 years. Currently, I am in charge of the coordination of international research collaboration on earth sciences at GSJ. My research has been on technology development of electrical and electromagnetic exploration methods for almost my entire professional career. Since the electromagnetic methods, particularly magnetotelluric method, have been expected to contribute in geothermal reservoir exploration, I have been gradually and heavily involved in geothermal projects both in Japan and overseas. I have enjoyed tackling the difficult challenges that were given to geophysicists for the precise and trustful understanding of the reservoir structure, but almost all the time unsatisfactory. “Geothermal geophysics” became my lifework. All people in a geothermal projects have to have a wide scope of knowledge and experience in order to participate in them adequately and accomplish a series of steps for geothermal development successfully. To support them, IGA could be the most important vehicle which promotes the education of young people on the up-to-date technologies and supports the exchange of updated, unbiased and accurate geothermal information in the world. It is our goal to become a great association, which provides constant support and attracts all the geothermal-related stakeholders in the world to the IGA network.